I am a true broccoli lover. It’s ranks up there with Brussels sprouts and asparagus as total favorite vegetable. 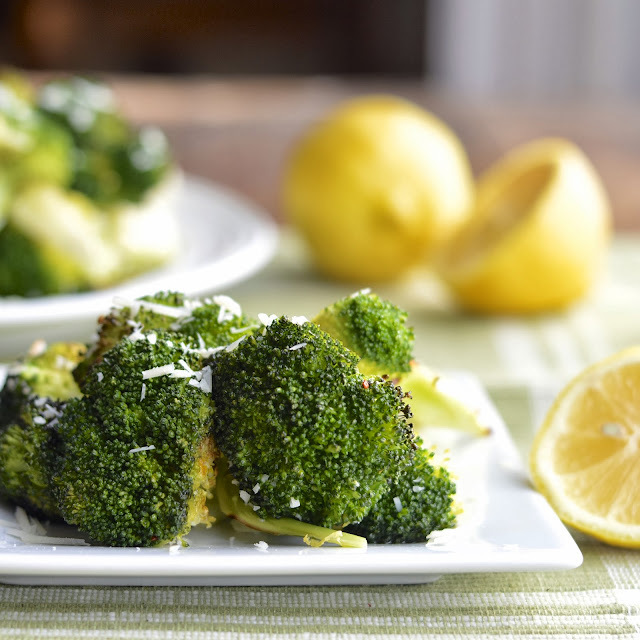 This roasted broccoli with garlic, parmesan and lemon is off the charts delicious and takes my love to an even higher level. This recipe is inspired by the Amateur Gourmet. A couple years of years ago when I first started blogging, I researched some of the top Alexa rated food blogs. 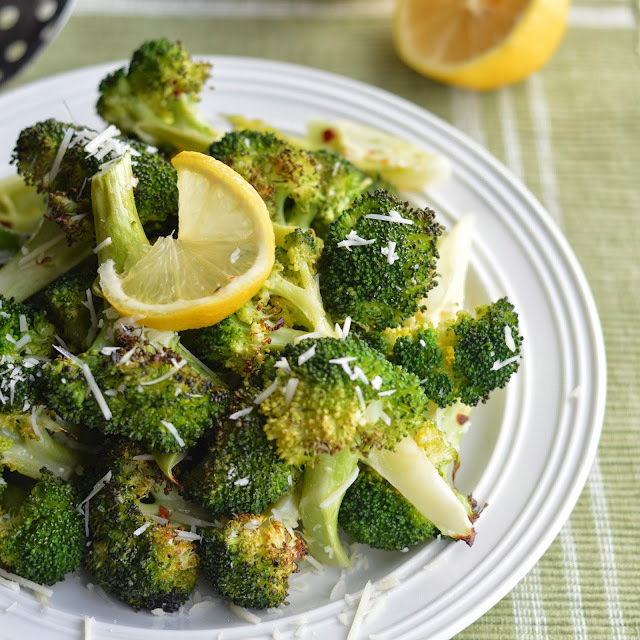 I came across this post by Adam Roberts and was amazed at how this simple broccoli recipe had gone viral and put Amateur Gourmet on the food blogging map. There were no breath taking pictures; just a catchy title, solid recipe and an engaging description. I roast my broccoli a lot – it’s my favorite method of preparation. Although I tend to be a floret girl, I do love the stems roughly cut and roasted. It’s a nice contrast and adds some extra crunch! So this week since FN Dish asked us bloggers to create a broccoli recipe, so I went back and checked out this preparation again. It’s super simple and super yummy. You may even get your kids to wolf down this less popular vegetable. One tip that Adam gives is incredibly important – the broccoli must be completely dry before roasting. I believe this avoids any kind of steaming and produces a wonderfully crunchy creation. I added some crushed red pepper flakes to the party because my family enjoys a little heat. It’s totally optional. 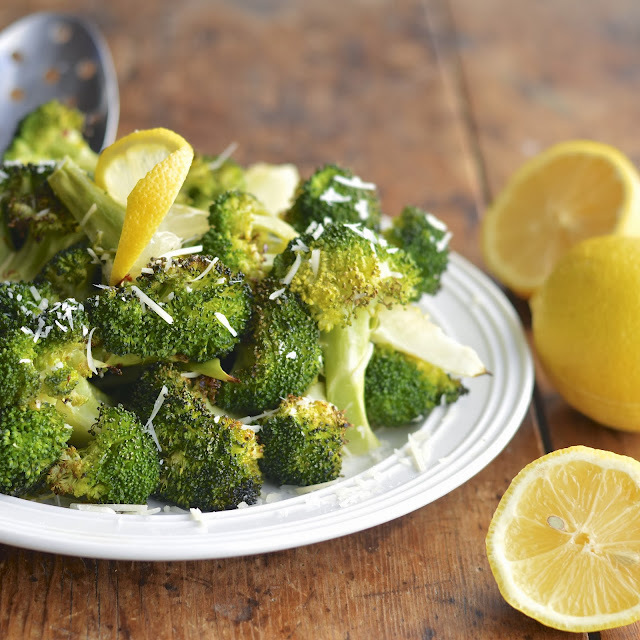 I think this roasted broccoli with garlic, Parmesan and lemon may get you excited about broccoli again. There’s a reason Adam’s post went viral! Place broccoli on a large baking sheet. Add garlic, pepper flakes, salt and oil. Toss until broccoli is coated with oil and ingredients are evenly distributed. Roast in oven for 20 - 25 minutes. The tips of your broccoli should be lightly charred and the stalks crisp tender. Toss with parmesan, lemon juice and zest. We love broccoli prepared this way. It's so light and healthy and helps balance out meals with lots of rich and heavy holiday food. The red pepper flakes are a nice addition. I made this and it was the lemon flavour was completely overpowering. I would suggest using a tablespoon of lemon juice and then adjust to taste. Thanks for the feedback. I love the idea of measuring out the lemon juice and adding to taste. Palates are different so this adds flexibility to the recipe.